Thanks to Gabriel B.W. Lerner, MS4 at Boston University School of Medicine, Boston, MA (USA) and Drs. Lija Joseph, Bethany Tierno and Arthur Lauretano of Lowell General Hospital, Lowell, MA (USA) for contributing this case and the discussion, and Dr. Andrey Bychkov for the Editorial Board review. To contribute a Case of the Week, first make sure that we are currently accepting cases, then follow the guidelines on our main Case of the Week page. (1) We are looking for pathologists (staff or trainees with staff supervision) with publication experience to write discussions for our Cases of the Week (see Case 457 and Case 459 for examples to follow). Discussion consists of a short introduction on the corresponding diagnosis, epidemiology, etiology, clinical features, sites, gross description, micro description, stains, differential diagnosis and treatment. Some sections may not be necessary depending on the case. References should be inserted after the appropriate text using the PubMed PMID. Best reason to be an author is helping pathologists throughout the world. 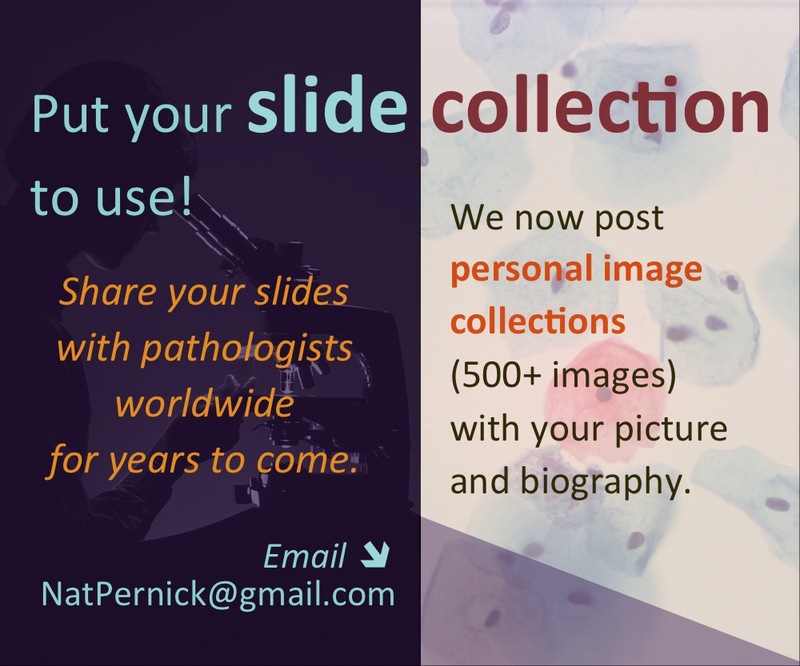 In addition, you gain exposure (8,000 pathologists subscribe to these emails) and receive $75 per discussion. If interested, please email Dr. Pernick at NatPernick@gmail.com and include writing samples. (3) Total sessions for January to July 2018 are up 27.7%, from 4,779,128 in 2017 to 6,101,024 in 2018. Page views are up 24.2%, from 11,777,371 in 2017 to 14,627,580 in 2018. Thank you for making PathologyOutlines.com the #1 website for pathologists. 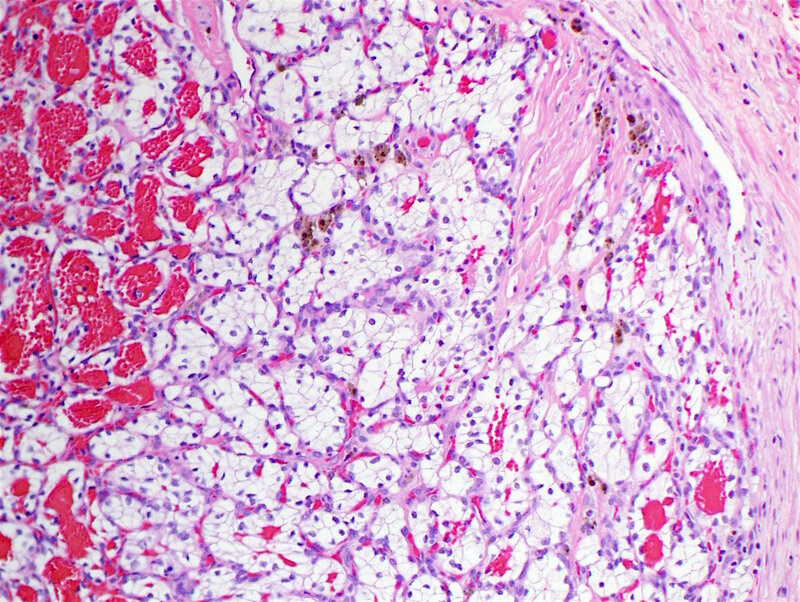 67 year old man presented with a thyroid mass. 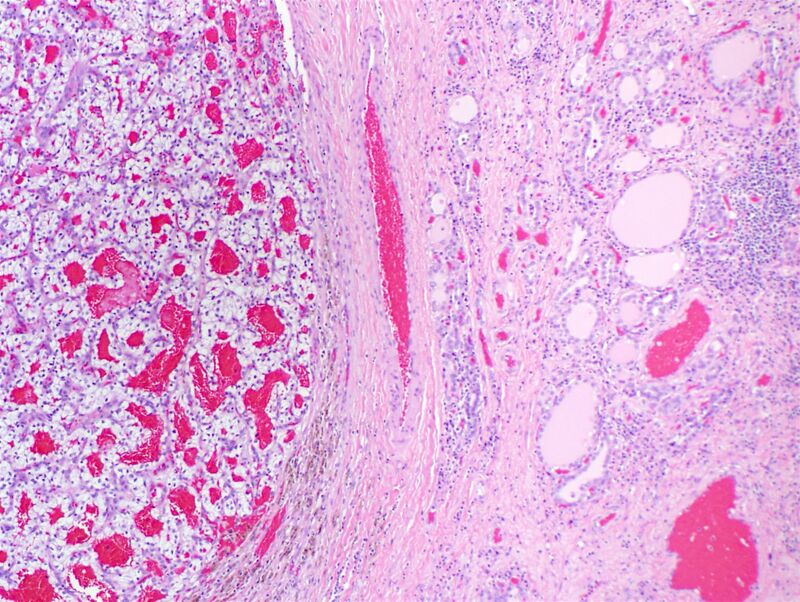 Metastatic disease is a rare but important diagnosis to consider during the examination of preoperative and surgical thyroid specimens. Any history of malignancy is important to consider when evaluating a thyroid nodule or mass. Symptoms of metastases to the thyroid may be nonspecific but at an advanced stage may include dysphagia and dysphonia; changes in thyroid function studies are rare (Ann Surg Oncol 2017;24:1533). Despite its abundant arterial supply, the frequency of metastasis in routine practice is < 0.2% of thyroid malignancies (Endocr Pathol 2017;28:112) and only 1.4-3% of all patients who undergo thyroidectomy have metastatic tumors to the thyroid gland (Thyroid 2012;22:258). 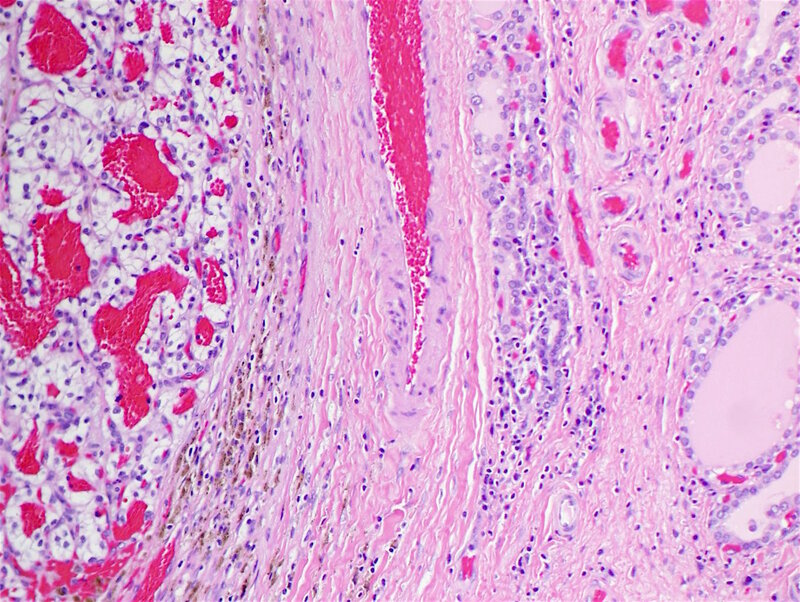 Two major hypotheses have been proposed to account for this observation: 1) relatively rapid arterial flow through the thyroid may discourage adhesion and seeding of metastases and 2) the high oxygen saturation and iodine content of the thyroid gland itself may directly inhibit the growth of malignant cells (Thyroid 2012;22:258). Most (60-80%) patients who present with metastasis to the thyroid have a known prior malignancy (Ann Surg Oncol 2017;24:1533). The metastases may originate from virtually any primary site; the most common sites of primary tumors reported in the literature are 1) kidney, 2) lung, 3) GI tract, 4) breast and 5) head and neck (Ann Surg Oncol 2017;24:1533). In contrast, autopsy series report lung as the most frequent site (Ann Surg Oncol 2017;24:1533). The differential diagnosis in this case includes clear cell tumors from the thyroid, parathyroid, lung and paraganglia. Other benign (follicular adenoma) and malignant (follicular and papillary carcinoma) lesions can contain clear cells. 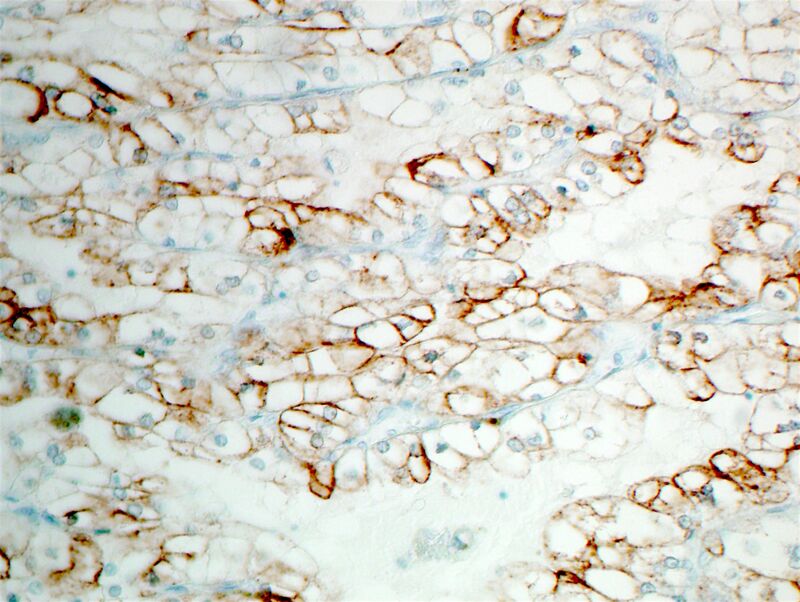 It is important to obtain a complete clinical history, prior surgical history and a panel of immunohistochemical stains, such as TTF1, PAX8, GATA3, CK7, CK20 and parathormone. 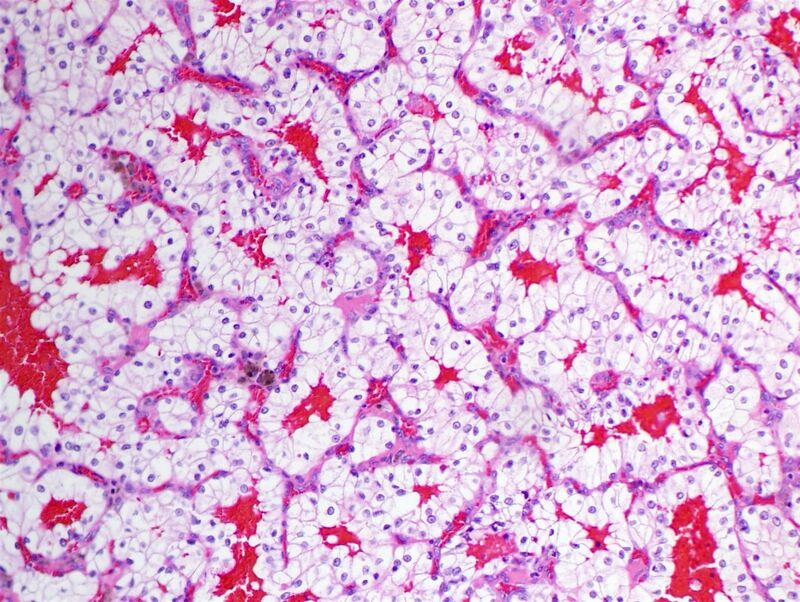 In this case, positive staining for vimentin, PAX8, CD10 and RCC, as well as the clinical history confirmed the renal origin. 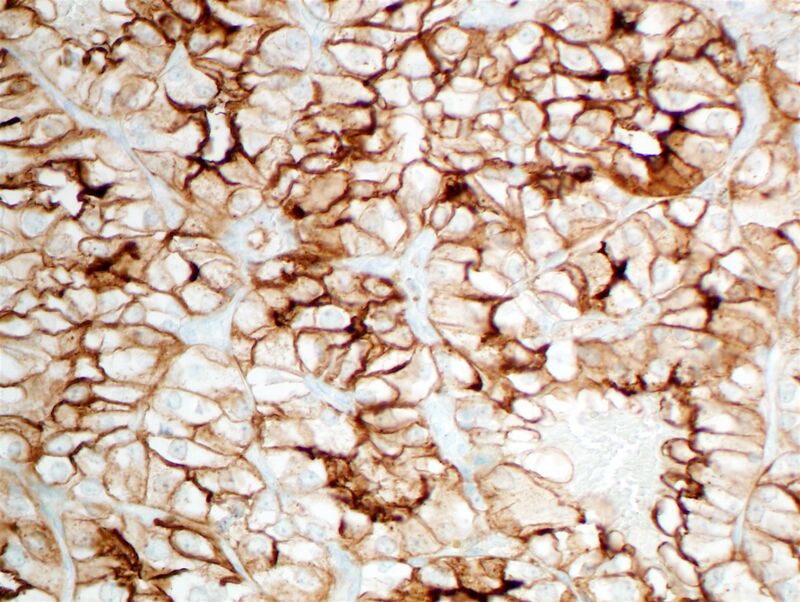 Interestingly, both normal parenchymal tissue, as well as many tumors of both thyroid and renal origin and epithelial ovarian neoplasms, often express positive staining for the transcription factor PAX8 (Paired Box 8) (Adv Anat Pathol 2010;17:377). 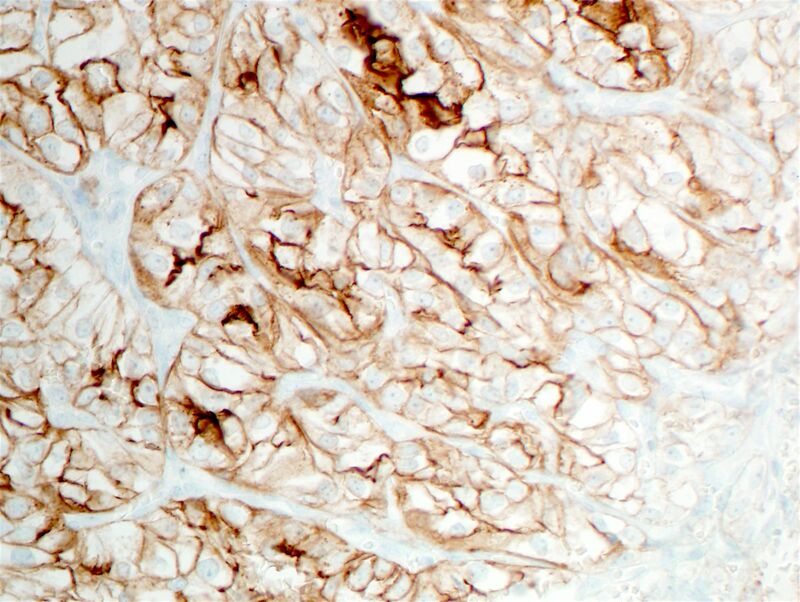 The role of PAX8 during embryogenesis may provide a clue as to why renal cell carcinomas may metastasize to the thyroid gland. Nuclear expression of PAX8 is an important pitfall to consider during differential diagnosis of thyroid versus renal neoplasms. 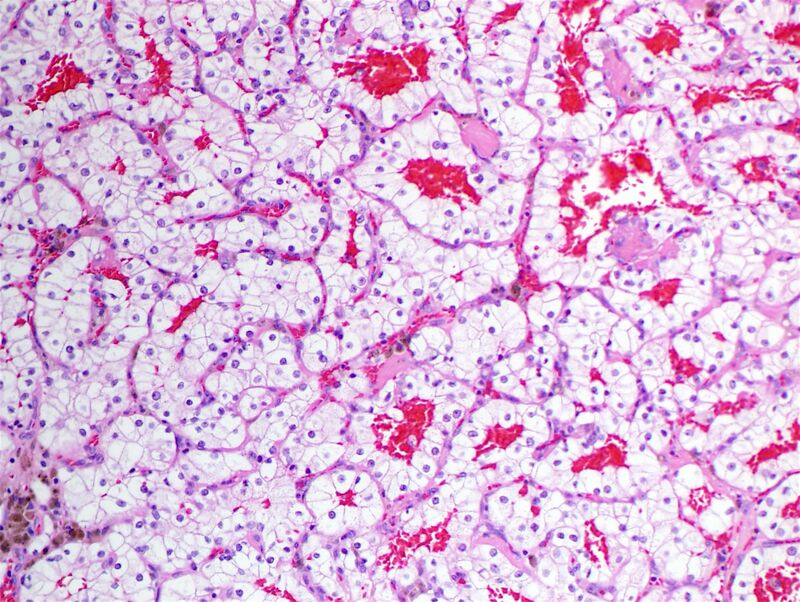 This patient had a remote history of pT3 Nx Mx clear cell renal cell carcinoma diagnosed in 2007, which was treated with nephrectomy but no adjuvant chemotherapy. He was closely followed clinically and was asymptomatic for 10 years. The thyroid mass was incidentally identified in late 2017. A staging workup following the pathologic diagnosis of metastatic thyroid disease revealed widespread metastases. Palliative care was initiated and the patient passed away 3 months after diagnosis.